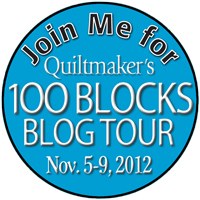 Over at Quiltmaker they’re going to town with the 100 Blocks series. A new volume of this special issue comes out every six months. I was delighted to learn that I have a block in the upcoming Volume 6. It’s always so much fun! Here’s a sneak peek of the cover. There’ll be a blog hop to celebrate the release of Volume 6 from November 5-9. 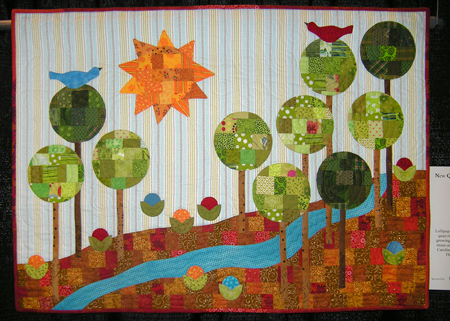 To follow the hop, start each day at the Quiltmaker blog, Quilty Pleasures, and they’ll send you off to visit the designers. There are lots of prize-winning opportunities along the way. My day is Monday, November 5, so stay tuned! PIQF has come and gone. Thankfully I managed to remember just about everything I needed to get done and bring along, and the weekend went smashingly. Such a lovely time, and it went by so fast. My booth was huge. Honestly I felt like the Queen of Everything. Or else I just welcomed visitors to my barn. I could get used to it :). I took pictures of of just a few of the many stunning appliqué quilts in the show. Machine pieced, hand appliquéd, hand quilted, original design. No surprise I was drawn to this one. 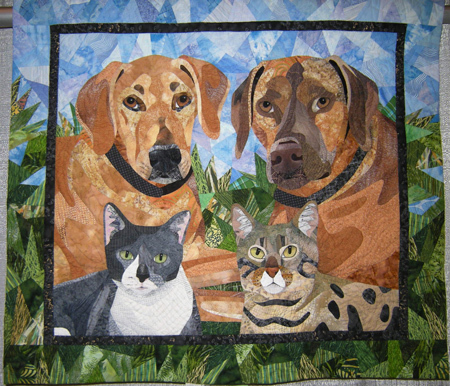 I always drop my jaw over Nancy’s work, especially since it has animals in it most of the time! Witness my earlier post about Pup Art. 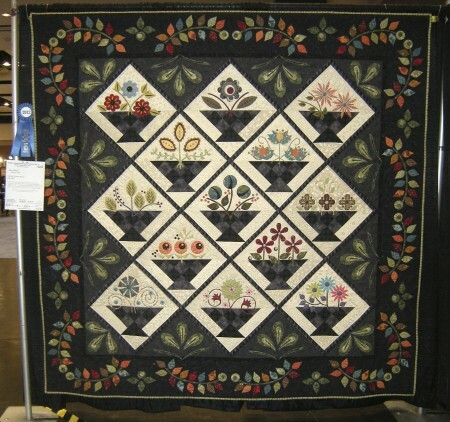 Leaves of Spring won a blue ribbon for Best Hand Workmanship, Wall Quilt Category. 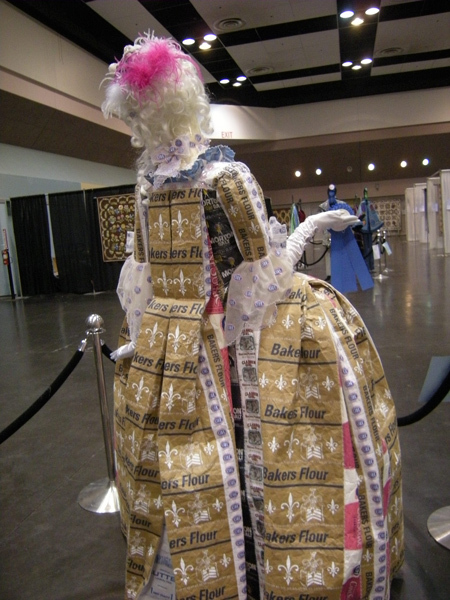 Now that’s one sweet dress! It had two ribbons on it. I especially loved the vanilla extract bottle detail. Blog reader Ellen Swedberg dropped by the booth to say hello. She mentioned that she and her mother Carol Jarvis had a quilt in the show called Swedish Album. I remember having seen it… it was a beauty of a quilt, with gorgeous appliquéd flower blocks and a blue background. The next day I set off to get a photo of it, and it had fallen off the face of the earth. I searched, I hunted, I asked white glovers, I asked friends, I looked it up in the program, but for the life of me I could not locate it again. I found a picture of it on the internet so please go see Swedish Album. When I found out I was coming to the show, I thought I would just drive there and back again every day. After all, the venue is less than an hour from my house. Well, if you’re not familiar with the area, I’ll let you know that between Santa Cruz and Santa Clara you have to drive a twisty turny mountain road over a small mountain range. After the fourth day I didn’t care to face Highway 17 again and decided I would stay Saturday night. The Hyatt (adjacent to the convention center) had room for me. I was mighty glad to wheel my stuff over to the hotel and check in. The upper floors looked different than the last time I stayed there, years ago when it was a Marriott. 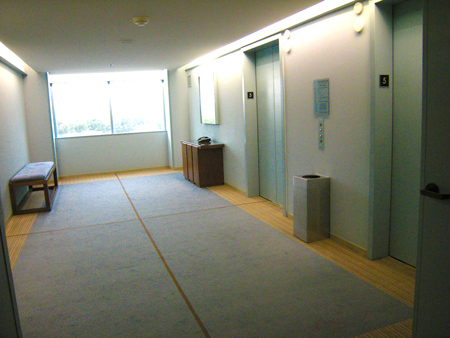 The hallway was a soothing shade of blue. 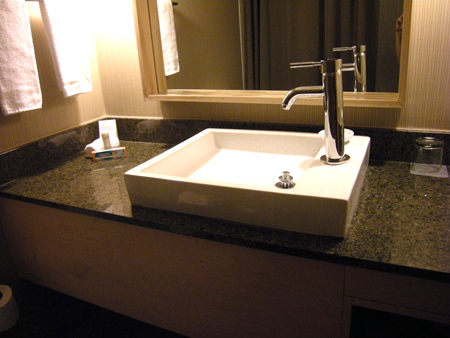 The room was very nice but I didn’t have the heart to tell them that they put my sink in sideways. 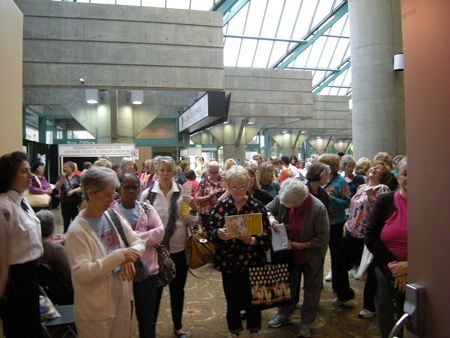 This was the lobby Sunday morning, just before the doors opened. If you recognize yourself here, you look great. This just in! Got a call this afternoon from the team at Pacific International Quilt Festival. They’d had a sudden vendor cancellation, and since I’m on their list for last-minute fill-in, they offered me a booth. Yippee! After five years of being on the waiting list for this fabulous show, I’m in! I’ve been attending PIQF since we moved to northern California 16 years ago, and it’s been a dream of mine to join the vendor ranks ever since I became a professional. If you’re planning on coming, please do stop by and say hello. I’ll be in #731, which they tell me is a big honking booth on a corner. I’m pretty excited. Better finish packing. Setup and preview night is Wednesday, aka tomorrow! Home for a few days. It was great meeting some of you in Sonora, Portland, and San Mateo. It’s always so meaningful to me to hear that you enjoy the blog. 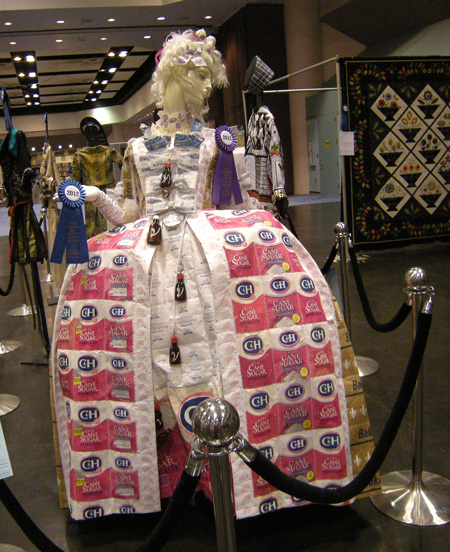 Next stop, the Simi Valley Quilt Guild show! 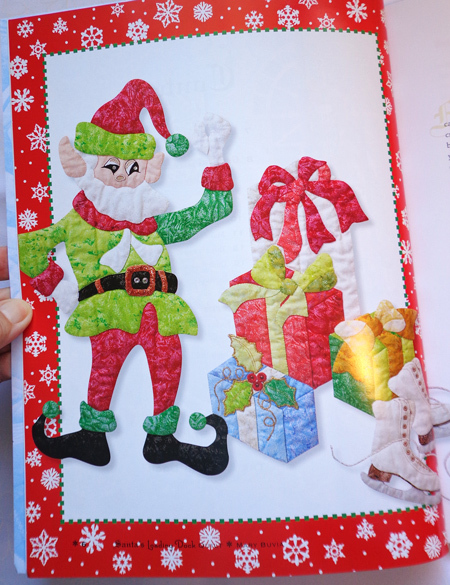 Now for this month’s featured appliqué book! 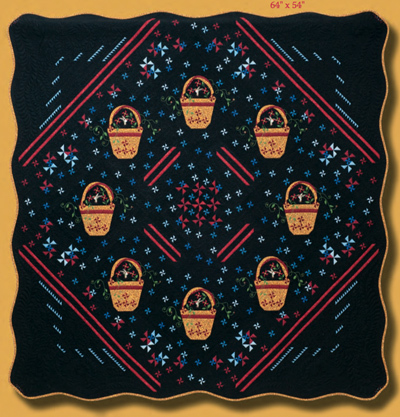 The National Quilt Museum in Paducah, Kentucky sponsors an annual contest and exhibit called “New Quilts from an Old Favorite.” The winning quilts are published in a book and I have the latest one, Baskets! 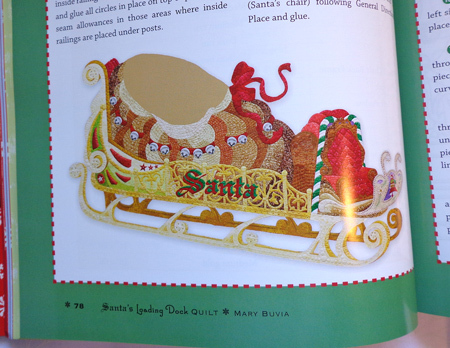 The top winner and cover quilt is Book Plate I by Karen Grover of Rockford, Illinois. I absolutely love the art nouveau bookplate-inspired appliqué design. While preservation of the past is one of a museum’s primary functions, its greatest service is performed as it links the past to the present and the future. Created both to acknowledge our quiltmaking heritage and to recgonize innovation, creativity, and excellence, the contest challenges today’s quiltmakers to interpret a single traditional quilt block in a new and exciting work of their own design. 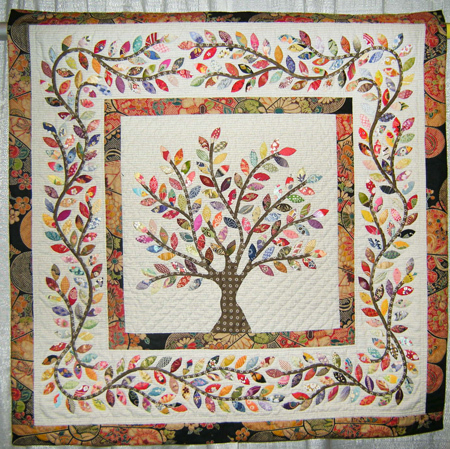 The book features the quilts of five award winners plus 14 additional finalists. 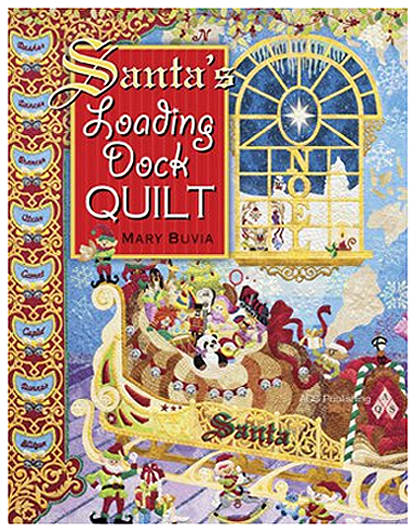 What I really like about this book is that it features not only the quilts but the quiltmakers and their respective processes. 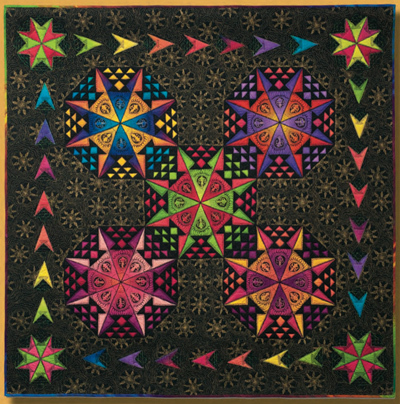 It’s fascinating to learn what each quilter was thinking, and see original sketches and inspiration, design problems and solutions, and techniques both new and old described in the quilters’ own words. 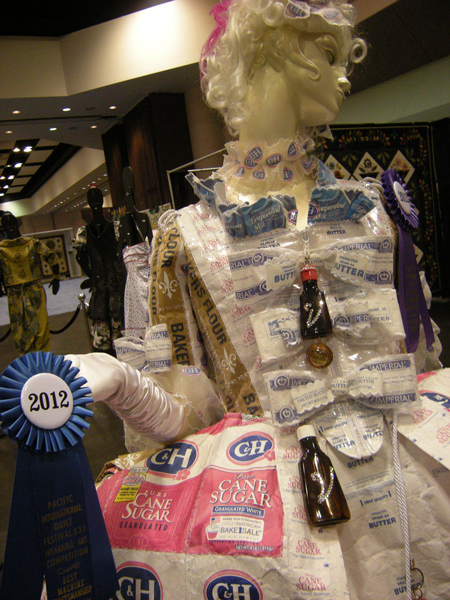 Second place was Basket Case by Leona Harden of New Tazewell, Tennessee. 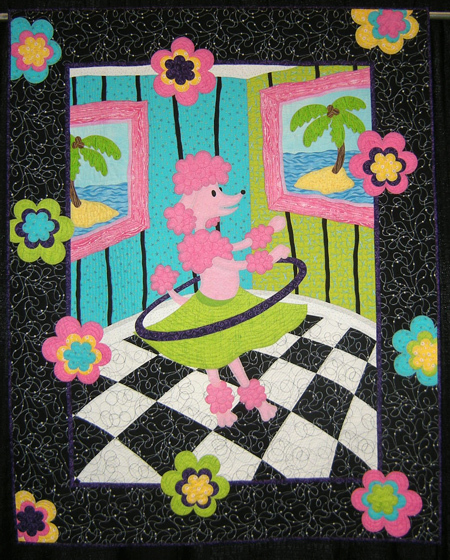 One of the finalists was Spinning Baskets by Theresea Reeves of Oberlin, Kansas. 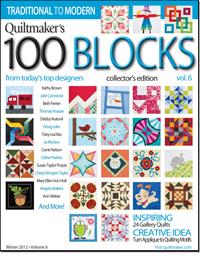 Courtesy of the publisher, the American Quilters Society, I can offer this beautiful book to give away in a drawing. 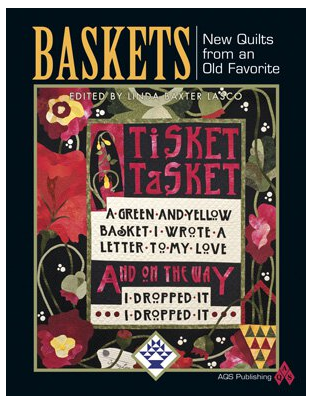 If you’d like to win Baskets: New Quilts from an Old Favorite, leave a comment here on the blog before 7:00 p.m. on Monday, October 8. Contest open to U.S. and Canada mailing addresses only.